Double your thrills on this giant double-lane slide rental. Twice as many riders can enjoy the race to the bottom. 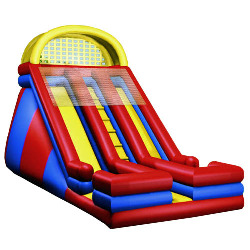 A great inflatable ride choice for larger events like carnivals and festivals that want higher throughput. Climbing stairs with hand ropes. Entrance in front, exit out sides. Unit is 22 feet tall including arch. Best for ages: 5 years to adult. Note: For ground surfaces that do not allow stakes, a sandbag fee will be added. Not for rain use. Requires 4 foot pathway to setup location.